Summer is a time of flowers and this month, the Unique Women in Business team is hosting a Flower Garden theme blog hop. In June, my daughters, a friend from college visiting from Arizona, and I visited a conservatory that had a beautiful display of summer flowers. The flowers’ fragrance could be smelled even before entering the room where they were located. One of the flowers at the conservatory. This week I made a new bunting that uses floral prints in every color of the rainbow. Each flag on the bunting uses floral fabric. The bunting is 8 1/2 feet long and uses a variety of fabic that I had on hand. Making buntings has been a wonderful way to use fabric and create something useful. I’ve begun planning for the upcoming homeschool year. One of the things I’m going to have Sophia begin this year is a “Book of Mottoes.” This idea came from Simply Charlotte Mason, a great resource for homeschooling following the Charlotte Mason method. Sophia could practice her best handwriting as she carefully copies sayings that are meaningful to her from the books she is reading and from a collection of quotes and poems I’ve found. Also with planning the homeschool year, I’m always looking for recipes that the girls and I can try that tie into something we’re learning. During the summer, we planted nasturiums so they could try edible flowers. The first flower bloomed the other day and more flowers should be following soon. If you have pictures of flowers, art work that you’ve created with a floral theme, or a recipe that uses edible flowers…or any other item you’ve made that includes flowers, please add your link below. That salad is beautiful! Love the colorful post. I love the bunting–very cheerful!Keeping a book of mottoes is a great idea. Don't think I've ever tasted nasturtium petals. I tried candied violets once and liked them! Love the look into your garden and the ideas you share…. Love the photo of the flower from the conservatory. 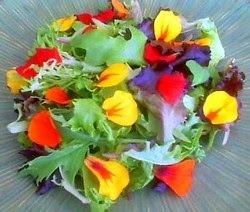 I remember eating a 'flower salad' many years ago – it is one of the must do things in life! on July 11, 2011 at 9:00 am | Reply Several flowers only here!